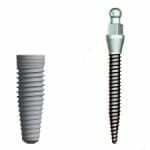 While dental implants are generally the ideal restorative for lost teeth, those on a tight budget sometimes find it out of their reach. Yet, they don’t want to wear removable dentures their whole lives, and are concerned about bone loss. To help patients in this situation, Dr. Burba offers mini-implants. Looking at the picture to the left, you can see the comparison of mini-implants to traditional implants. Mini-implants are about one-third the diameter. Their smaller size makes the surgery less complicated. There is no need for a surgical flap which cuts down both on cost and healing time. These aren’t strong enough to support a tooth, like a full-sized implant, but, done properly, they can be used to anchor your dentures and prevent any further bone loss. If you’re interested in securing your dentures with mini-implants, you may call our office to schedule an appointment or click here to request an appointment online.